Some surprising results from a seat-of-the-pants statistical analysis on a global basis of guns, gun ownership, gun-related deaths, overall crime rate, and the effect of being in a rich or poor country on the likelihood of being involved in a crime or homicide, whether as a perpetrator or victim. I also offer a couple of workable steps to significantly reduce homicides and gun deaths backed up by the results of the surveys. No one would deny that people kill people and that while it is not a common occurrence, it is not all that uncommon either. Guns that people use in combat, sport shooting, and hunting are also routinely used in killing each other. Some guns used in military combat leak into the general population when warriors return or when civilian unrest peaks. These guns are also used to kill our colleagues or families in disputes or in committing crimes that potentially involve face-to-face encounters. The primary difference between military weapons and non-military guns is the rapidity with which they can fire bullets. Automatic weapons are banned to civilians in most countries. However, the difference in rapidity of firing between the more sophisticated semi-automatic weapons and that of the military is largely irrelevant in that a semi-automatic with a large capacity magazine can fire as fast as the holder can pull the trigger, delivering bullets up to 2 per second. A fully automatic weapon can destroy a wall much more quickly than a semi-automatic gun, but both are capable of killing a crowd of people at about the same rate, because the gun must be aimed for each person you want to kill or maim, no matter how fast the bullets come out of the barrel. So for all intents and purposes, a semi-automatic gun is almost as lethal as a fully automatic weapon in a “real-life” situation. And in most urban situations where a person shoots to kill another person, a semi-automatic handgun is the weapon of choice. For recent mass killing especially in crowded civilian areas, the persons who plan these usually include a look-alike military weapon and hand guns. I have been amazed at how many reporters and commentators make statements that appear to be contradictory, so I thought it would be interesting to look at the statistical aspects of these discussions. Needless to say the statistics do not tell the entire story, but they are interesting and at least suggestive of the real situations. In looking at these statistics, I decided to use the entire world, so that variations in culture, local ideologies, and so on are all jumbled together. By lumping everything together and teasing out just the actual variables we want to look at, the answers are simplified, but may also be a tad misleading. It is often argued that people kill people, not guns. It is also argued that guns are not related to overall crime rates or gun violence or death rates etc. The concept is that no matter what weapons are available or not available, people will still kill each other at more or less the same rate. In carrying out these statistical analyses, I relied on data from the World Bank, IMF, FBI, CIA, some of which are available on Wikipedia, some of which are not, and a few other sources. In most cases, comparable data was not available for every country, so the number of data points varies according to the number of countries where direct comparisons could be made. More Guns: More, Or Less Crime? Are guns and crime rate directly related? In a survey of about 75 countries, there is no discernible relationship between the number of guns owned per person and the overall crime rate. Overall crime rate is related to other factors, not whether people own lots of guns or not. On the X axis each country is given a number (rather than listing the name) and the Y axis is either the number of guns per hundred people (the red line) or total crime rate (blue line) as number of crimes per 1000 people. The rates of crime vary greatly by country, but lots of guns does not mean lots of crime, neither does it mean not much crime. Are the number of guns owned per person what determines the rate of gun deaths? In the same 75 countries, there is no obvious relationship between the number of people who die from being shot and the number of guns owned per person on a country-wide basis. Once again, countries are on the X axis listed as a number. 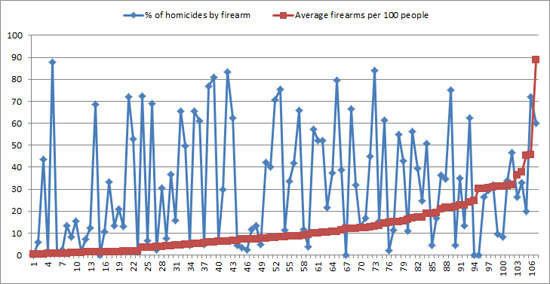 The Y axis is either the number of guns per 100 residents (the blue line ranging from almost none to nearly one per person), or the gun-related death rate (per 100,000 people, the red line). So gun ownership is not related to overall crimes and not related to overall death rate by guns. But this includes accidental discharge, shooting yourself, being mistaken for a game animal, and so on. Let’s separate out the intentional homicides, and exclude the accidents and suicides. The X axis is numbered countries, and the Y axis is either percentage of homicides by guns vs all deaths by guns (the blue line) or the average number of guns per 100 people). Well, there you have it. For well over 100 countries, there is no relationship between the number of guns per person and the % of homicides (vs all deaths by guns). So guns do not have any direct relationship to the murder rate. Does Gun Toting Reduce Homicides? This means if you are allowed to carry a gun, and you want to kill someone, you will likely use the gun. What is the effect of carrying guns on homicides? On overall homicides, the difference is about 4 homicides per 100,000 people. It more than doubles the rate of homicides. On gun-related homicides, difference is even more startling. Gun-related homicides rise from 1.2 to 5.1 per 100,000 people, a factor of almost 5 times. To be allowed to carry guns essentially doubles the overall homicide rate. This is the exact opposite of the idea that carrying guns will reduce gun violence. In fact carrying guns doubles the death rate by homicide and raises the risk of gun death by a factor of 5 times. Guns and Suicide – Any Relationship? What effect does gun ownership have on suicide rate by guns? The X axis is countries listed by number, not name. The Y axis is either the number of guns per 10 people (the red line) or the number of suicides per 100,000 people (blue line). Guns certainly appear to be directly related to rate of gun death in suicide attempts. The more gun ownership is available, the more people use guns to kill themselves. In a morbid and sad way, this actually makes sense. If a person wants to kill themselves, it is hard to do it to yourself by repeatedly hitting yourself with a hammer, or stabbing yourself repeatedly, or even bringing yourself to jump off a bridge. And given a bit of time when you screw up in your attempts to kill yourself, the urge to die probably diminishes. With a gun however, you are less likely to mess up. Guns are quick, easy, and very deadly, so you are much less likely to have a second chance to think about what you have done. Given that being allowed to carry a gun doubles the overall death rate, it is likely this is true for suicides as well. 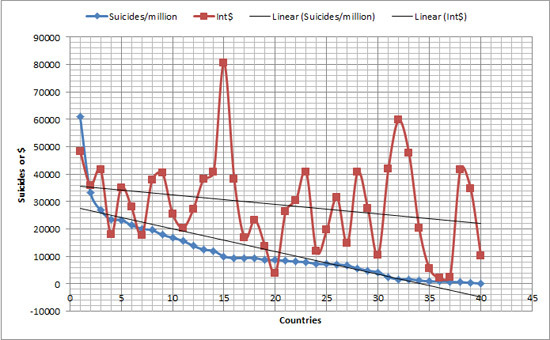 The X axis is countries listed by number not name and the Y axis is number of suicides per 100,000 people per year. The blue line represents males and the red line represents females. So men are more likely to commit suicide than women. Increasing gun ownership does not reduce crime. Increasing gun ownership does not change overall death rates from killing each other. BUT, allowing people to carry guns, doubles the overall homicide rate and is responsible for roughly the equivalent of all homicides in non gun-carrying countries. So disallowing gun-carrying should significantly reduce homicide rates, possibly by as much as half. AND gun ownership is directly related to suicide death rate by guns, so reducing or banning the ownership of guns would significantly reduce the gun death rate by suicide and thereby the overall rate of suicide deaths. Harsher Punishment. Does it Reduce Crime? Countries differ in the punishment for crime. In many countries the philosophy is to make the punishment more harsh to reduce crime rates. Does increasing the harshness of punishment actually have the effect of reducing crime rates? The X axis is countries listed by number not name. The Y axis is either the total crime rate per 1,000 people (the red line) or the number of prisoners per 100,000 people in each country (the blue line). No, total crime rate does not appear to be affected by holding many more prisoners per capita. Harsher punishment appears to have little affect on crime rates. The X axis is country listed by number not by name. 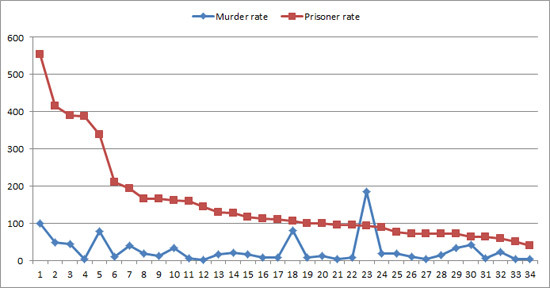 The Y axis is either the number of prisoners per 100,000 people (red line) or the murder rate (homicides per 10,000 people). Nope, harsher punishments do not appear to have any effect on murder rates. Harsher punishment does not reduce or increase murder rates. The implication is pretty obvious. If you are going to kill another person, it is likely that if you get caught you will suffer the maximum penalty the state provides, including being killed yourself. Thus there is no possible disincentive. Poor Countries Have Way More Crime – Right? What about poverty and homicide? In this case, the data are not especially good. There were not really enough countries to make a good analysis, but here are the results. The X axis is country listed by number not by name. The Y axis is either homicide rate per 100,000 people (red line) or the poverty rate as self-defined percentage by each country). There is no clear relationship between degree of poverty as defined by the country’s own standards and homicide rate. The wealth of a country is often described by the average personal purchasing power (PPP), a better measurement than gross domestic product (GDP). Testing the relationship between wealth and crime is akin to testing the relationship between the rate of predation and parasitism versus the amount of resource available in a biological system. A system can withstand a greater frequency of loss or mortality if the resource base is strong. In this case, there is a possible tendency of murder rate to be related to wealth, but it is not a clear relationship. 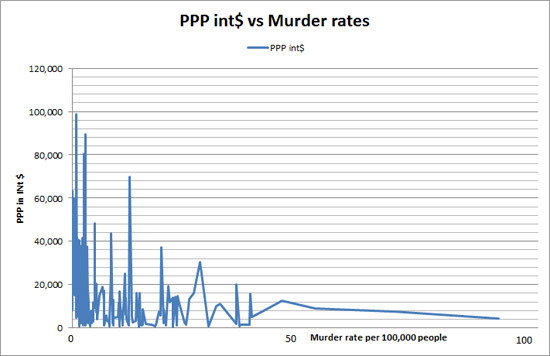 Next let’s look to see if total crime rate is related to average personal purchasing power PPP. The X axis is the country listed by number not name. The Y axis is either the average spending power for a resident expressed as a an index (PPP – the blue line) and the total crime rate expressed a crime per million people (the red line). In this case, the relationship is more evident. There is at least a weak relationship between the average personal purchasing power and the total rate of crime in a country. 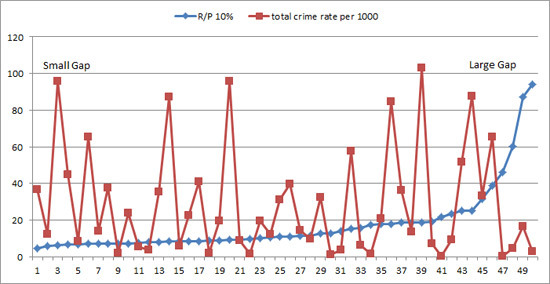 The variability, however is very high and so the relationship is relatively weak, indicating there are other variables also influencing the murder and total crime rates. Another surprise is the relationship between PPP and suicide. Without much thought I assumed that as people got less rich they would turn to desperate measures such as suicide to solve their problems. That may still be case, except it is not suicide to which they turn. Increasing wealth, not decreasing wealth seems to give rise to increased suicides. Next I wondered if perhaps crime is related instead to the income gap between the rich and poor in a given country. One reliable measure of that gap is the ratio of the average income of the richest 10% to the average income of the poorest 10%. The X axis is country listed by number not by name. The Y axis is either crime rate expressed as total number of crimes per 1,000 people ( red line), or the gap between rich and poor expressed as a ratio (blue line). Guess what. There is no direct relationship between the overall range of income gap and total crime rates. The only possible exception is that in the most extreme group of countries with the highest gap ratio, there is a very low rate of total crime. This could be an artifact of the reporting from those countries or it could be a direct result of extremely large and effective security forces. We already know that harsh punishment is not an effective deterrent to crime, but presumably if the risk of being caught is high, the crime rate will drop. Conversely if the risk is low, crime rate will rise. Let’s look at civil liberties as a measure of a tolerant society where the risk of getting stopped or caught is low. The X axis is countries listed by number not by name. The Y axis is either a civil liberties index (the blue line with a range of 6) or the total crime rate per 100 people (the red line). This looks suspiciously like there might be a relationship between a more open society and increased crime. The X axis is the average crime rate per 100 people (red line) and the Y axis is the range of civil liberties (blue line). Here is another way to look at the same data simplified. 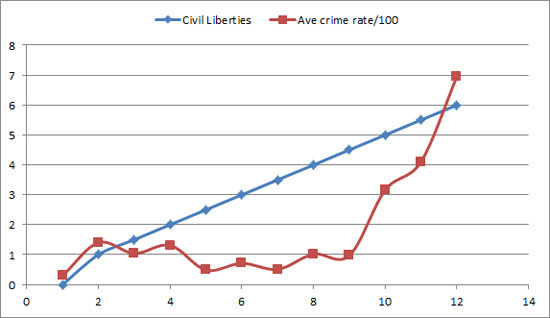 In the second graph the average total crime rate is plotted against the level of civil liberties allowed in a country. In both graphs, you can see that civil liberties have a definite relationship to crime. In fact, there is a pronounced inflection in the shape of the curve at about a civil liberties level of 4.5 (out of 6). If this is a real description of reality, it suggests there is a level of trust beyond which a significant number of cheaters will take advantage of the system. This is also true of other animals where a loose hierarchy shows more cheaters than a strict hierarchy. In human terms there is a balance that a country may wish to strike between civil liberties and civil security, assuming some other measures cannot be taken to cut down on cheating (criminal activity). Turning to Crime to Get Health Care? One might think that people who are in situations where they are desperate for health care, might resort to crime to alleviate the situation. Although it is not entirely accurate, we might consider that the average expenditure per person on health in any given country would reflect the general health of the population; that is the more spent on health, the healthier the people are likely to be on average. There is probably a factor built into this number that reflects the general ill-health of a population as well. The X axis is the country listed by number not by name. The Y axis is either the health expenditure per person in US$ (blue line) or the crime rate per 20,000 people ( the red line). In fact, the opposite is true, the healthier a population, as reflected in the amount of money they spend on their health, the higher the rate of crime. Will Education Reduce Crime Rates? Perhaps the more educated people are the more they will realize the consequences of their actions in trying to cheat or kill each other. The index used in this graph is the % of GDP a country spends on education. This is not an exact measurement of the education, of course, but it is an indicator. The X axis is the country listed by number not name. 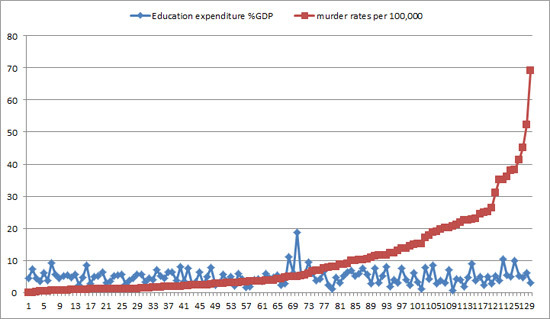 The Y axis is either the expenditure on education expressed as a percentage of country’s GDP (the blue line) or the murder rate per 100,000 people (the red line). Again, the result may not be as expected, but it is clear. There is absolutely no relationship between the amount of money a country spends as a proportion of its GDP on education and the rate of murders in that country. The X axis is country listed by number not name. The Y axis is either education expenditure expressed as a percentage of GDP (the blue line) or the crime rate expressed as the number of crimes per 100 people (the red line). This time the situation is a little different and perhaps a little surprising. The graph shows a tendency for a country’s higher education expenditures as a % of GDP to be associated with higher crime rates. The relationship is not really very strong and the increase in crime is modest, but it is certainly present. When we examine murder rate and total crimes, we find there is a weak and somewhat surprising relationship between total crimes and murder rates. As murder rate rises, total crime rate declines somewhat. The X axis is country listed by number not name. 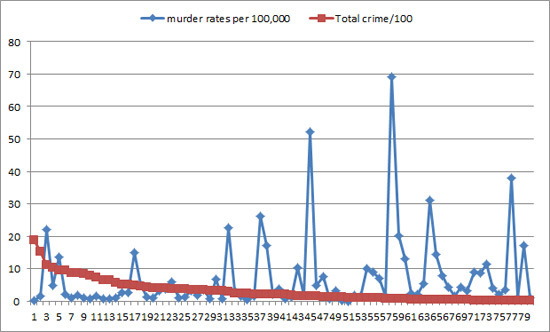 The Y axis is either the murder rate expressed as homicides per 100,000 people (the blue line), or the total crime rate per 100 people (the red line). Looking at crime rates versus all gun deaths (including suicides and accidental deaths), we find that while there is slight correlation between overall crime and murder, there is a stronger correlation between total gun deaths and total crime. This might not be what you expect, but recalling that suicide rates are strongly related to gun ownership, it is reasonable that this would increase the relationship between gun deaths and crime rates. The X axis is country listed by number not be name. 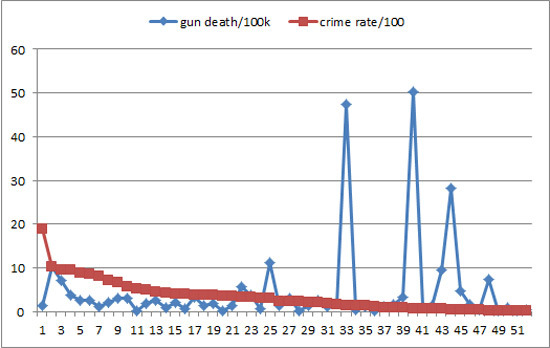 The Y axis is either the rate of gun death expressed as gun deaths per 100,000 people (the blue line) or the crime rate per 100 people (the red line). In this group of 51 countries, at least, increased gun death rates appear to be related to a lower overall crime rate. High gun death rates, lower crime rates. Low gun death rates, higher crime rates. As a cross check, examining the relationship between murder rates and suicides, we should not expect to see any relationship. The X axis is the country listed by number not name. The Y axis is either the number of suicides per 10,000 people (the blue line) or the murder rate per 100,000 people ( the red line). And sure enough there is no apparent relationship between murder rates and suicide rates. Previously we found a strong relationship between suicide rates and gun ownership. 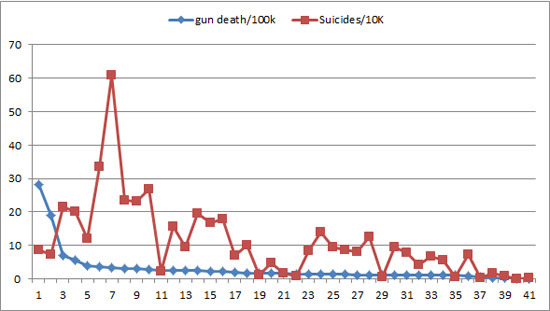 What about the relationship between suicides and total gun deaths. We should expect the relationship to be similar, although not identical because overall gun deaths are not strongly related to gun ownership. The X axis is the country listed by number not name. 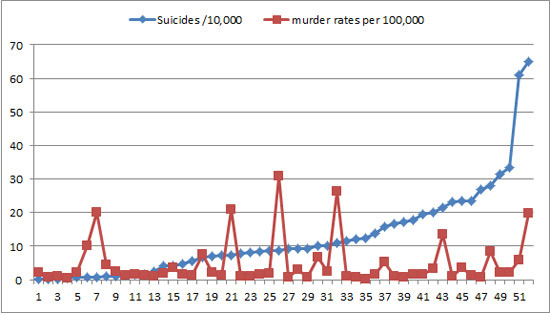 The Y axis is either the number of people killed by guns per 100,000 people (the blue line), or the number of people dying by their own hand – suicide – expressed as suicides per 10,000 people (red line). The scales are different because more people commit suicide than kill other people. Sure enough there is a relationship, but it is not as strong as the relationship between gun ownership and suicide rate. I found some of this quite unexpected, but let’s see if we can make sense of what I found by surveying country statistics on a global basis. First, the statistics are great for some things and not so great for others. To do a fully accurate set of surveys one would want to have better access to the statistics and their failings. Secondly it is complex. There appear to be only a few answers to the many questions and some of those answers are unsettling. So let’s begin with the obvious. 1) If no one had guns, no one would die of gun deaths. However, people still want to kill each other and also sometimes to kill themselves. So they will find ways to kill themselves and each other regardless of whether guns exist or not. Humans have always killed each other and themselves, so this is not a surprising, although somewhat unhappy fact of life and death. 2) According to the surveys, the rate of gun ownership by itself does not influence the rate of gun deaths. In other words if there are guns, people will kill each other and themselves with guns, but at least overall, it is just another tool. 3) Increasing gun ownership does not increase intentional homicide rates. 4) Gun ownership does increase suicide death rates by guns and it is a strong relationship. It is very easy and quick to kill yourself with a gun, and not so easy or quick by virtually any other method. Using a gun means you probably don’t get a chance to rethink your planned course of action, so death rates are higher using guns, and if guns are available people will use them. 5) It is often said that carrying guns will reduce both crime and death rates. Comparing countries that allow guns to be carried to those that do not, reveals the exact opposite truth: gun death rates are five times (5x) higher on average in countries where “gun-totin’ folks” are allowed. In addition, overall homicide rates double in gun-carrying countries. 6) Murder rates and overall crime rates were also a bit of a surprise and deserve a second look, but based on the survey information I have (about 50 countries with comparative data), murder rates appear to suppress total crime rates. Countries with high murder rates have generally lower overall crime rates. You can draw your own conclusions, and it is a bit macabre to think why this should be. 7) There is no relationship between murder rates and suicide rates. That probably means the motives for murder and suicide are mostly unrelated. 8) The most prominent knee-jerk reaction by politicians to calls for reduced crime is to increase the punishment by using longer sentences and lower standards for imprisonment. Both result in more people in jail. Increasing numbers of people in prison has no effect on the overall crime rate, nor does it have any effect on the murder rate. This means it is a waste of money and people to increase the level of punishment. 9) Oddly, although arrest rate, rather than incarceration rate or length does seem to have a deterrent effect on crime, the actual data to support this contention is not easily available except in small local areas, mostly in developed countries, so I could not confirm or deny this idea with global statistics. 10) I often hear that poverty is the root of crime, and in fact, I thought this was a pretty reasonable idea. But according to global statistics, poverty (as defined by each individual country) is not related to the homicide rate. In fact, there appear to be two “centres” of high homicide rates: the Caribbean and Africa. Some of the countries involved do not consider their poverty rates to be especially high. 11) In case poverty was not a good statistic, I then used the average personal purchasing power of individuals in each country (PPP). Crime rate does not behave the way you might expect. 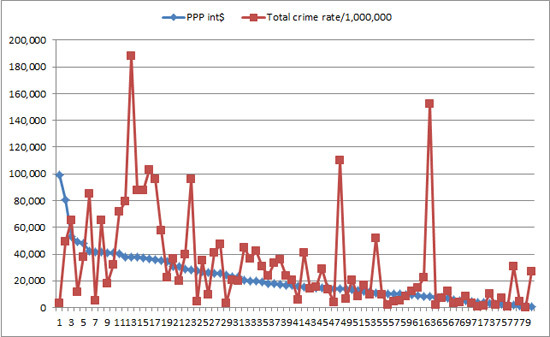 The higher the PPP (as a trend) the higher the crime rate. So the wealthier the people are the more they commit crimes. 12) Murder rate also increased with PPP, but the relationship is weak and there is a great deal of variability, so it is not a strong relationship. This fits with earlier findings that murder rates and overall crime rates are not related. 13) On the other hand, the relationship between increasing wealth and increasing rates of suicide is clear. Higher PPP values are related to higher suicide rates. 14) Given the rather surprising result that decreased wealth also decreases the crime rate in this analysis, I wondered who was committing the crime, and even though the country might be rich, perhaps the poor were still committing the crimes. That statistic was not directly available so I tested using the gap between the richest 10% of the country and the poorest 10% of the country as a variable against crime rate. Once again the result was that the widest gap, implying the poorest people at the bottom, was correlated with the lowest crime rates and the countries enjoying a relatively more equal distribution of wealth had higher crime rates. 15) Next I wondered about health. If people are healthy do they need to turn to crime? The % of GDP spent on health expenses had an effect, but it was not what might be expected. The more spent on health, the higher the crime rate. 16) Education was a little difficult to measure, so I used the average expenditure per person in each country as a measure of emphasis on education. That in itself was interesting, but as a variable in affecting murder rate, it had no influence. Crime rate and education expenditures however, were weakly related. Better educated people tend to have on average, a slightly higher crime rate. 17) In this last measurement, I examined the index of civil liberties against crime rates. I was not sure what to expect, but the answer is that the crime rate seems to require a level of civil liberties equivalent to about 2/3 of the available scale before it rises significantly. Once civil liberties reach a reasonable level and rise, then crime rises rapidly with the degree of liberty. Gun ownership means guns will be used in murder, suicide, and accidental deaths. Gun ownership increases the rate of suicide deaths. Gun ownership and overall crime rates are not related. Gun ownership and total homicide rates are not related. If guns are carried, gun homicide rate is increased by a factor of 5 and overall homicide rate by a factor of 2. There is no relationship between murder and suicide. Increased punishment has no effect on overall crime rates. Increased punishment has no effect on murder rates. Increasing poverty (country defined) has no effect on homicide rates. Increasing income gap between rich and poor has no effect on overall crime rates. Increasing education expenditure has no effect on murder rates. Increasing average personal purchasing power increases (not decreases) crime rates. Increasing average personal purchasing power increases (but only weak relationship) murder rates. Increasing average personal purchasing power increases suicide rates. Increasing health expenditures increases crime rates. Increasing education expenditure slightly increases overall crime rates. Increasing Civil Liberties markedly increases crime rates. People, as most social animals, have found ways to be communal and within those communities to be socially adept allowing an easier more comfortable life style. In addition, the communities are better able to protect their livelihoods and territories than individuals can. Some animals routinely use tools to gather food and ward off predators. Anyone who has walked in the jungle can probably tell the story of being pelted by monkey-tossed fruit or branches. Animals like chimps use tools as weapons in individual or communal combat and especially in aggressive displays. So the idea of using a spear, for example, as both a tool to capture food and also to ward off or to defeat another animal in combat has a long history in evolution. Given that people inherit many of these characteristics, it is not surprising that people have been able to develop a dazzling array of weapons for use in hunting and fighting. Clubs, spears, swords, bows, slings, guns, bombs, missiles, drones, chemicals, and pathogens are merely advances on the non-human prototypes that we see in birds, apes, and elephants. They are however, pretty amazing advances and in some cases are capable of lethal effects on masses of people at one time. In human society, most countries do not allow individuals to own weapons like bombs, missiles, drones, chemicals designed to kill, or weaponized drones. These weapons are restricted to the military. Pretty well anything else goes however, in at least many countries. Japan is one of a few countries that specifically outlaws swords unless the owner has a permit. And of course, if a person is determined to hurt or kill another person, there are many household tools that can be used for this purpose, including kitchen knives, construction tools like hammers and screwdrivers, or over-the-counter and prescription drugs. In a rich, healthy society there is a much better resource from which to steal. The better educated you are the more likely you are to be able to use the knowledge in committing the crime. In a more open and liberated society, people tend to trust each other more and so security is less tight, leaving more opportunities for people to cheat and commit crimes. Why a rich, healthy society should lead to a higher suicide rate I must leave for the psychologists. However, it is clear that something in these societies leads to suicide and if guns are present (perhaps more easily so in a wealthy society) people will use them to kill themselves. Unhappily guns are a very effective tool for such a purpose. Guns are just another tool to kill or maim someone. They are however very effective, so the society that arms itself and carries those arms is much more likely to use them to kill. There is no easy solution, of course. I wish there were an easy solution. However, having some basic knowledge in hand makes the problem smaller. Step #1. Outlaw carrying guns in public to everyone except military and police. Step #2. Increase the arrest rate for carrying guns illegally in public. Confiscate and destroy all illegal guns. These two steps alone will decrease the overall homicide death rate and overall death rate dramatically. In countries with gun permitting, it is often difficult to distinguish between people of normal and evil intent carrying guns. Gang members use this to their great effect and much of crime rate in developed countries is directly related to gang activities. In the US for example, many reports suggest that 75% to 80% of gun deaths are gang-related. Significantly reducing the ability of gangs members to carry guns will significantly reduce the use of guns as a normal activity. Step #3. Communicate widely and effectively what the reality of guns and crime rates are. This will stop the rancour and enable rational legislative action. Gun ownership is a major problem for suicide, but not much else. Carrying guns is a major menace to society. Step #4. Communicate the principle that crime increases with increased wealth, not decreased wealth. Cheaters (criminals) will always try to find ways to parasitize the wealth. In both biology and culture, ratcheting up the anti-parasite or anti-predator mechanisms results in an evolutionary reply in kind. The higher the risk of being caught (even with a moderate punishment) reduces the cheating (parasitism, predation, criminal activity). Harsher punishment is mostly ineffective as a deterrent to crime of any kind. Rehabilitation (although I didn’t test it) would seem to be a logical part of the correction process. Reducing hysteria and non-evidence based polarizing statements is a first step to allowing rational research to continue the process of reducing crime, homicide and suicide. The United States came into being largely through a revolution that was staged by civilians using guns and other weapons that they had primarily as hunting weapons, as well as left-over swords and more military hardware. 6) facilitating a natural right of self-defense (at the time a strong police force largely relied on recruiting deputies from the local population). In the US today, the National Guard is the formal civilian militia. Civilians are no longer encouraged to act as vigilante policemen. Both insurrections (usually political protests) and routine crime as well as extreme criminal acts are now handled routinely by professional police forces. Fortunately the threat of slave revolts was handled more humanely by abolishing the status of slave. The threat of invasion is now entirely different to the threat that was posed in the late 1700s. Bombs, air attacks, missiles, and a host of other weapons now make small arms ineffective against a real invasion. The professional armed forces of the US are more than adequate to handle any invasion that might be posed today from another nation. This leaves two fears, both of which seem to be a major factor in the psyche of the US civilian population that make them feel the need to be well-armed, often with semi-automatic weapons with large magazine loads. The first is the underlying fear that the government will get so big it will become tyrannical, and that the strategy to allow government to do so is first to control the use of guns, then to remove the right to bear arms all together, at which time the population will become enslaved by “big government.” To many people in the US, this seems to be a real and present danger. The second is the need to defend yourself. Most often the anecdotes used to explain this need are from home invasion. The homicide rate by guns in the US (2.97 per 100,000) is not the highest in the world (28th), but in comparison to other developed countries it is very high. Next on the list among large developed countries is Italy at 0.71. The nearest neighbour to the US is 0.51. And the UK, from whom the US fought to be released, has a very low gun homicide rate of about 0.07. By contrast, among developed countries, the US has a relatively low overall crime rate, so the actual risk of crime is much lower in the US. From a self-defense perspective, however, while the risk of being involved in a crime is low, the risk of being killed if you do get involved is very high. The difference in risk from being killed in a crime is between 3 and five times higher in the US than in most other developed countries. So there is reason for the US citizen to be fearful for their lives in a crime, many of which are in fact home invasions. Recalling that in countries that are allowed to carry arms (such as the US) the death rate by guns is about 5 times as high as in countries where citizens are not permitted to carry guns, there may be a correlation. That is if the US did not permit guns to be carried, the death rate might drop back to where the rest of the developed world finds itself in respect of gun deaths in crimes. This alone would save thousands of lives. The US gun death rate is about 10,000 per year, whereas most of the developed countries are at about 20 to 100. Removing the right to bear arms in public, would not violate the 2nd amendment which allows people to bear arms. Instead they would be able to bear arms in their homes to repel home invaders, and to go on legal hunting expeditions and regulated sports events such as at target ranges. However, it is of course the choice of the people of the US to decide if it is worth it to sacrifice 10,000 people per year so that they are allowed to carry guns in public as compared to being allowed to have guns in their homes and on regulated sport events. For farmers and rural civilians, such a law would not change their permitted use of firearms. The two remaining fears (tyrannical government and self defense) would be alleviated by allowing guns at home and in regulated sports. Fascinating analysis, this, and not one I’ve ever seen done before to this level of detail–which I find, frankly, astounding. I’d be very interested to know about the standard deviations of many of these data sets, though, along with trendlines, degrees of correlation between different variables, the identities of the individual countries involved (I worry about the possibility that comparisons of third-world and first-world countries may not be valid, as well as the possibility that some of the data points may represent anomalies as a result of warfare, civil unrest, etc. ), and so on and so forth. Is there any chance you might upload the Excel (I presume) files you used to create this to Google Docs, or some similar host? I’d love to see what other information might be teased out of this data, as well as try to quantify the strengths and weakness of the various correlations/anticorrelations. If that’s too much bother, of course, I can always patch the information together from the same sources you used, but lazybones that I am, I’d prefer not to go through that rigmarole if it isn’t necessary. Thanks either way! Thank you for the comment. I also was amazed not to see this kind of analysis, but the datasets easily available are not always that great. In some cases the number of countries is close to 175, in others it only about 30 or 40. Comparisons of 3rd and 1st world countries can hide some relationships. For example, across the world (data was good for this) the number of guns per person was not positively related to gun deaths, however in the US alone (I did this later and can add it) there is a strong +ve correlation on a state by state basis between gun ownership and gun death. The lack of a +ve relationship on a global basis I think is because of the two centres of gun death where drugs are a major problem (parts of the Caribbean and Africa). Most of the other global correlations are likely to hold. That the US stopped much of its research on guns and crime/suicide, etc. in response to NRA pressure is truly unfortunate. The data set on US “personal defense” use of guns is non-existent. The best available are estimates and they range over three orders of magnitude depending on the author, so there are no credible statistics that I could find. Your solutions are also not so simple, because you never once touch on the fact that the majority of gun crime and murder is committed by those (mostly gang members) who are not obtaining weapons legally. Banning citizens who are legally obtaining weapons from carrying them isn’t even going to put a dent in the gun homicide rate, since citizens who legally buy weapons account for a very low percentage of gun homicide. I appreciate the work you put into this, but much of is is jumping to conclusions and speculation. Thank you for your observations. I agree that this was a very preliminary analysis (and I commented that it was as well), but it is remarkable that so far no one has undertaken a more rigorous analysis like it. The intent was to draw attention to the fact that there are tendencies in the debate about gun violence that hold across many countries. Not all of these tendencies will be valid in every country. Places with high drug crime for example are standouts (parts of the Caribbean and certain countries in Africa), but I haven’t had time yet to add those dynamics to the mix. All of the graphs I drew would be better handled with multi-variate statistics where multiple factors are considered simultaneously. I can’t imagine why this has not been done yet. It would make a wonderful and especially relevant and useful PhD thesis. Yes, it is quite correct that Japan has a very high suicide rate and very few of those use guns. There are other countries as well that are above and below the theoretical correlation-ship. On average throughout the world, however, and even specifically in the US, successful suicide rate is directly correlated to gun availability. So my suggestion that reducing or banning guns would reduce successful suicides is statistically correct on average, but might not help much in some countries or under some conditions. Your comment on gang-related crime is especially true in the United States. When I have some time I would love to go after the statistics in the US. However the NRA has successfully put a crimp in collecting relevant statistics and carrying out such research in the US. So that will be a difficult study. Your suggestion that restricting access to the purchase of guns (legally) would not reduce the flow of illegal guns may or may not be true. If the control of guns were something like in Switzerland (where they do have a citizen militia and where everyone in that militia is issued a personal gun and an allotment of bullets), and no other guns are permitted (except under strict regulation) might just have the desired effect of reducing illegal guns as well. In any case, especially in the US, gun homicide, while gruesome and way higher than anyone would like, is in fact not the major cause of gun deaths. They are mostly due to suicide and accident. If you do have access to better statistics or some evidence-based ideas on what might reduce the very high gun death rate in the US, it would be interesting to have you post it here. The Revolutionary War and the War of 1812 would have turned out very differently if people had to stay in their homes to “bear” their arms. But I suppose we’d at least live in a gun-free society if we were still part of the British empire. Essentially, they already assumed you could do whatever you wanted in private. [9th Amendment.] This was, in fact, so strongly assumed that they didn’t bother to write a privacy amendment…there was no need. The same as self-defense. Or the right to hunt for food. Those things have been natural rights for as long as there have been humans. Interesting commentary. Thank you. Couple of minor things first: America is not British because it revolted successfully against the British regime. Canadians are not American because the Americans were defeated in their attempt to take Canada in 1812. British and Canadian societies certainly are not gun-free although their death rate per person compared to the US is tiny. The second amendment deals with keeping and bearing arms. Whether this provision protects the individual’s right to own firearms or whether it deals only with the collective right of the people to arm and maintain a militia has long been debated. I have no intention to attempt to resolve the debate. Modern interpretation in the US seems to favour the right to keep and use arms without specific restriction to military use. In law, the right to keep and bear arms is limited to certain series of classes of firearms, blade lengths, and entertainment explosives. The law also declares the use of weapons against other people except in military or in self-defense (and that has limitations as well) to be illegal. So if everybody obeyed the law, no one would be killed with guns except in accidents or suicides. People who use guns to commit suicide are not technically breaking the law in the US, so while that is incredibly sad and one would hope completely unnecessary, it accounts for more gun deaths than homicide and is quasi-legal. The enormous death toll in the US by guns attracts attention and engenders fear. The use of statistics is only helpful if they are interpreted in the context of finding a solution to the problem of excessive gun deaths. They are not in the least useful in defending or criticizing a political or ideological position, neither of which is changeable by logic and evidence. As a US Citizen you are free to espouse your own interpretation of the various amendments and promote those ideologies legally through your elected representatives to attempt to further restrict or further enlarge the legal interpretation of the bill of rights. In so doing with regard to the 2nd amendment, I would hope your intention is to find solutions that work to reduce the number of deaths and injuries by guns. Just out of interest, statistically if you have guns in the house you are much more likely to die by a gunshot. Statistically if people carry guns, the likelihood of being killed with a gun is greater. To those advocating for guns in the house and packing guns, the evidence would seem to be irrelevant. So the solution to gun deaths in the US must be something else. Attitudes? Education? Rigorous training and lengthy wait periods? Reducing the American warrior/macho stance? Increasing community awareness and networking so everyone cares for their neighbour instead of fears them? I do not know the answer, but right now the US has a major problem and loses many thousands of potentially fine people every year to needless gunfire. If you have a solution, let me know. Where can I access your data sets? Some thoughtful statistics. I did notice that you included homicide in a lot of your graphs. Did you consider the comparison of criminal homicide to justifiable homicide? I could not find any recent documents on that comparison. The most recent I found was done by the St Louis University Park Law Review in 1999. Here is a link to that document for educational purposes. I’d be interested in more recent statistics since the trend for more liberal gun laws have been enacted. Yes, it will be interesting to see if the trends change with more liberal gun laws in the US. At the same time as the gun laws have become less stringent, the difficulty of gathering evidence in a valid research mode is also increasing because lobbyists successfully argue against carrying out research that might have a negative impact on the gun sales. The recent case where a judge disallowed restricting gun stores will add to the gun prevalence as well. In some ways it is an ongoing experiment to test the gun lobby hypothesis that more guns will reduce the gun injury and gun death rate. My personal prediction is that greater prevalence of guns will increase gun injury and gun death rates. It is possible to add other societal and cultural influences so that guns and gun injuries are not so closely linked (much greater restrictions on who uses them, how they are stored, required coursework and testing, cultural training so weapons are not the first choice for settling disputes, significantly more intervention in suicide risk, and so on). Is that likely in the US? Not just now with the “John Wayne” attitude to solving problems with guns and weapons rather than discussion, compassion, and compromise. OK, I read the article again (I had seen and used it already). The overall homicide rate in the US is roughly twice that of other countries that have strict laws against carrying guns. Or to put it another way, if the US copied other countries that disallow carrying guns, the US homicide rate would likely be cut in half. If we consider only gun-related homicides (ie exclude suicides, accidents, legal gun deaths, etc. ), allowing people to carry guns increases the gun homicide rate by a factor of nearly 5 times. The conclusion is that people still want to kill each other, but are only half as successful if they can`t carry guns, and if they have a gun handy, they will most likely use it. Also the success rate of suicides in markedly increased by having guns in the household. It relies extensively on Kleck`s widely discredited estimates. But even if the article were correct, about the only proposed conclusion is that the victim homicide rate is reduced by 41% because victims have guns. The overall death rate is not actually reduced that much because the attackers, family members, friends and bystanders are more often killed or injured than the attackers. So what do we end up with? We still end up with a country that kills at twice the rate of other countries that don’t carry guns. Because we can’t dissociate gun-carrying criminals from gun-carrying victims in the US, the statistic is really quite meaningless. If you look around, in countries where people in general are not allowed to carry guns, the death rate does not go up by 41%, instead the homicide rate is cut in half. Why is this? Most likely because in countries where gun-toting is not common, criminals engaged in crimes of non-violent intent also don’t carry guns. The only obvious logic is that gun-carrying promotes gun-carrying, which statistically at least doubles the homicide rate. In ever more lax laws, it is likely that more gun-carrying will promote more gun-carrying and while we may see more shoot-outs between victims of crime and the attackers, the most likely overall effect will be to increase the number of homicides (“justified” or not). One wonders if the wise men who crafted the second amendment to the US Constitution would see 15,000 unnecessary deaths per year as an appropriate consequence of their actions. Or would they (the so-called Founding Fathers) more likely see that as a completely unintended consequence and work to revise the second amendment that they themselves had crafted? I would like to respectfully point out what I believe is a fundamental flaw in your analysis. You compare countries across the board. That is an apples to oranges comparison. Cultures and economic status have way more to do with your data than gun ownership. For example, in America, suicide is taboo, but in Japan it is considered honorable. Even in a given country, there are huge cultural variations. Murder is for more “acceptable” in the ghettos than in the rich parts of the same cities. The best available evidence comes from correlating an increase/decrease in gun ownership to an increase/decrease in crime in that same area. So far can tell, a decrease/ban on gun ownership has CONSISTENTLY lead to an increase in crime. And an increase in gun ownership has CONSISTENTLY lead to a decrease in crime. Thanks for the comment. I agree that comparing countries with different cultures and attitudes can affect the results. Mostly what it does though is increase the variability of results, and in the study I could not pick out any trend related to number of guns per person. If you can link me to actual studies such as you describe, that would be very helpful. I did compare economic status and crime rates and there is only a very weak suggestion richer people kill more frequently. So that won’t be a confusing factor. It seems the number of guns per person is not a factor either. What is a factor is if people can legally carry guns in public. Gun carrying increases gun murder rates by a factor of 5, and overall murder rate by a factor of 2. This suggests that gun ownership is not an issue but legal gun carrying is an issue. In fact the stats suggest that if gun carrying were illegal in the US murder rate overall would be cut in half and gun murders would be reduced to about 20%. (notthat I personally will need to…HaHa). You certainly put a fresh spin on a topic that has bsen written about for ages. I’m much interested in your analyses but because you seldom label the axes and units elsewhere in the presentation are sometimes missing, I’m having trouble interpreting your graphs in detail. At times readers could also use some help on the meaning of some of the red and blue labels. Because the term rate is commonly misused, in your use of the term rate may I always rely on the units being per unit time (yr)? Many thanks for your interest. Your are correct, I should have labelled the axes. Unless they are labelled otherwise, the x axis is an ordinal list of countries and the y axis reflects the other variable described in the blue and red labels (percent or rate). The definition of rate is in the text (I hope) such as per 100,000 people. There are more recent articles that are more specific to the USA, but it is difficult when there is a implicit ban on collecting accurate information in the US. The basic conclusions hold even today: suicides are twice the rate of homicides and made easier by using a gun. Most homicides are by intimate partners and guns make the situation worse because they are effective. Guns in the house increase the risk. Guns used as effective deterrents are rare occurrences. It’s comical how flawed this analysis is to anyone with even a cursory grip of statistics. You arbitrarily cherry-pick which parameters fit your agenda and produce incomprehensible graphics (axes purposely not labeled, as to cloak the fact that they too are arbitrary) which wow the unintelligent into thinking you made a point. Are you familiar with the Spinal Tap “These go to eleven” speech? Sounds like you wrote it. I have added an explanation for each axis. So there is no misunderstanding what each axis represents. Cherry-picking implies I left out a relevant variable. If you would like to suggest which one(s) I left out we could examine those as well. I did not parametrize anything. Finally, if you would like to present an alternative analysis, complete with the data and variables charted that you feel are most relevant, you are most welcome to post it as a comment. If you would prefer, I would be pleased to present your analysis as a blog under your authorship on this website.